Until a couple of years ago, I always had Ro*Tel Diced Tomatoes and Chiles in my pantry. And yes, for years that was the product that completed chile con queso for me, along with Velveeta. If you’ve been here before, you know that I am on a canning kick, having just learned how to can properly. (Diary of a mad canning woman.) Last week, I picked a bowl full of Joe Parker Anaheim peppers. I put them in the fridge, having not decided what to do with them. This morning, I thought I might make a Green Chile Stew and put a chicken into the slow cooker. While looking at recipes, one chicken stew recipe called for Ro*Tel Diced Tomatoes and Chiles. I knew then that I wanted to make my own, and can it. So, I again began the process of scoring, and par boiling the tomatoes. Once peeled and cored, I squished them into a pan. 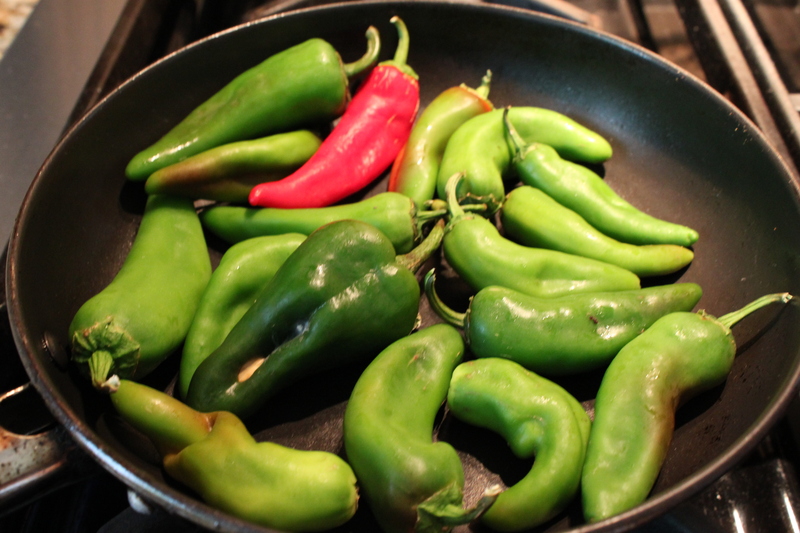 I then took the peppers and blistered them in a small skillet. 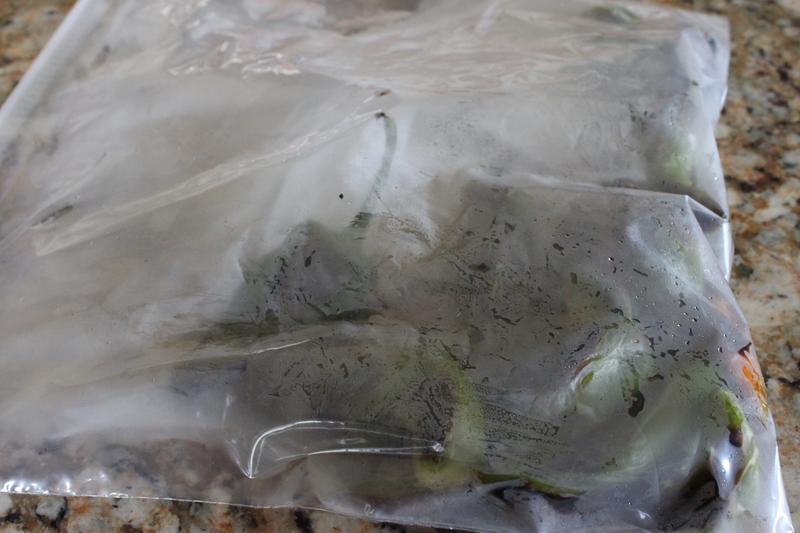 Once blackened, I tossed them into a gallon baggie to steam. The steaming makes it easier to remove the skin and softens the chiles. After I peeled and chopped the chiles, I threw them into the tomato mixture and let it all cook for about 10 minutes, while I sterilized the jars. Into each jar, we a 1/2 teaspoon of salt and a tablespoon of fresh lime juice, to increase the acid. The end result, was two jars of Tomatoes and Chiles. I’m always happy when the jar top seals after the 10 minute water bath, indicating I’ve done it correctly. Now, some folks think I’ve gone a little crazy with the canning, and that’s OK. I’m taking another class soon, for sweet stuff, and as we speak, there is a modern canning book en route to my front door. More crazy on the way! Oh, yea, the chicken. With the tomatoes and chiles that were left after filling these two jars, I added the shredded chicken, onions, Mexican Oregano, and the stock it cooked in, and made chicken stew for dinner. Carla, this looks so much better than RoTel. My mouth started watering when I saw all the chiles blistering on the stove. 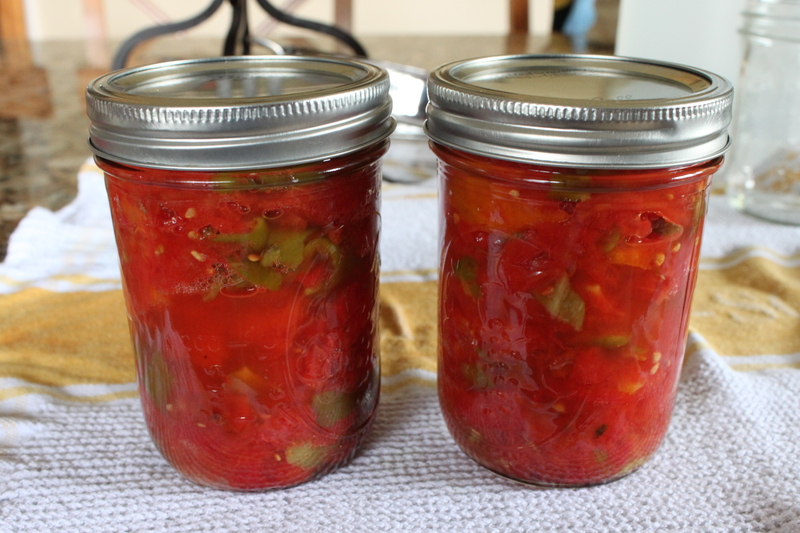 Did you learn this recipe at the tomato canning class you took a few weeks ago, or somewhere else? It was totally a “lightbulb on” moment out of necessity. I had picked those peppers from my garden, with no plan for them, and had tomatoes from the farmer’s market that I was going to oven dry, so it just made sense. I had been poking around recipes all afternoon for green chile stew, and most called for Ro-Tel. So, I just decided to make my own. It is the plain canned tomato recipe from Dai Due, with roasted chiles thrown in. How many tomatoes and chiles are used! Looks great! Ive got tons of tomatoes, gonna make some today! Sherry, I don’t recall the proportions – this was a while ago. When you add peppers to the tomatoes you change the acid, so be sure to add some lemon, lime or citric acid to your recipe. Peppers have to be pressure canned . . . not water bath. I was right there with you until you water bathed these. In canning you always have to can to the most “needy” veggie. 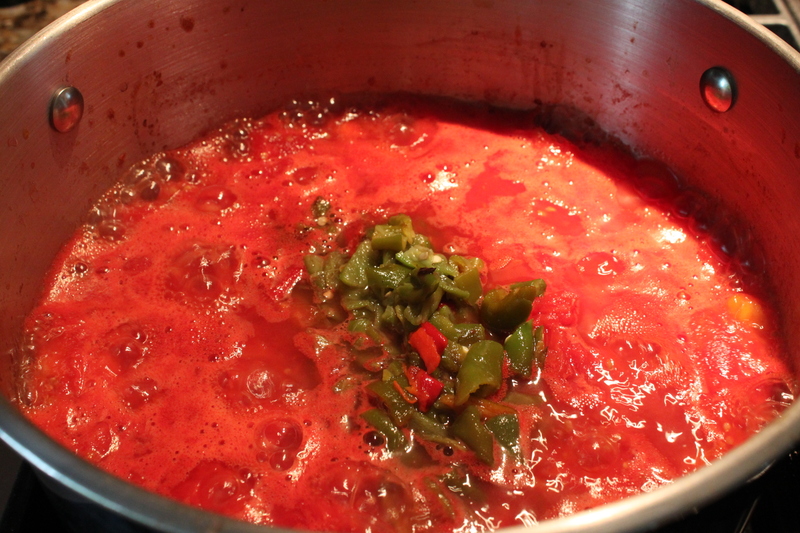 Like this – tomatoes can be water bathed but peppers can’t, so you need to follow the instructions for pressure canning. I too need a pantry full of these jars! Sweet! I have all these plants running wild and wanted to do just the same thing. Thank you so much ! Those complicated recipes just drive me mad. I’ve read what’s on the back of the Rotel can. This just has no of the preservatives, and I know mine is organic. Thank you. With my gigantic garden I’ve been canning everything I possibly can. Mel, formally of Austin. Now a resident of the RGV. Melanie, make sure to add more acid, lemon,lime or citric acid to compensate for the lower acid peppers.